In Chokmah is the Radix of blue and thence is there a blue color pure and primitive, and glistening with a spiritual Light which is reflected into Chesed. And the Sphere of its Operation is called Tzedek or Justice and it fashioneth the images of material things, bestowing peace and mercy; and it ruleth the sphere of the action of the planet Jupiter. And A1 is the title of a God strong and mighty, ruling in Glory, Magnificence and Grace. And the Archangel of Chesed is Tsadkiel, the Prince of Mercy and Beneficence, and the Name of the Order of Angels is Chasmalim, Brilliant Ones, who are also called the Order of Dominions or Dominations. The Sephira Chesed is also called Gedulah or Magnificence and Glory. Chesed is the first Sephira below the Abyss, and the first of the six Sephiroth making up Microprosopus, the seventh Sephira, Malkuth, being the "Bride of Microprosopus." origin of Kether out of the Unmanifest, but the origin of Microprosopus, from the Elohim of Binah, in Chesed. The formless and void darkness of the Supernal Triangle gives rise to manifestation, which is form and light. There is no light in Binah, only a "thick darkness," nor is there form, only what we have called the "will to form." In Chesed is found the beginning of manifestation, the externalization of the combined potencies of the Supernals. It is the initial urge toward material structure as we know it and, as such, is the administrator of the Laws first proposed by Binah. Chesed is Chokmah on a lower arc, from which emanated the pure form of Binah. As evolution proceeds toward Chesed, across the Abyss, and back to the Pillar of Mercy, the positive impetus of that Pillar acts on the energies of Binah (The Divine Energy of Kether is externally modified and transformed through the various stages of the Tree of Life). This may help to explain the attribution of male deities to the "Female" side of the Tree of Life, and vice versa. To reiterate: as Chesed emanates, it must now deal with the form which was created by Binah, and it does so in terms of the positive qualities of the Pillar of Mercy. There is a good analogy in the Emerald Tablet of Hermes Trismegistus, which describes the action of various energies on what it calls the One Thing. God so arranges that the Father of this One Thing is the Sun, its Mother is the Moon; it is carried in the Belly of the Wind, and nursed by the earth. The pattern of Sun (Fire), Moon (Water), Wind (Air) and Earth is clear. To truly understand the Tree of Life, we must constantly remember that we are dealing with multiplicity in unity. The One Thing evolves from Sephira to Sephira across the Tree of Life. As the Tablet continues: "It ascends from the Earth up to Heaven, and descends again, newborn, on the Earth, and the Superior and the Inferior are increased in Power." What is described here is the constant renewing effect of the Ain Soph, which stimulates birth, death and rebirth on an increasingly higher and more powerful level. As Binah is best understood in its relationship to Chokmah, so Chesed must be studied as the equal and opposite of Geburah. In the swing of energies back and forth on the Tree of Life, Chesed builds up (anabolism) on the principles proposed by Binah, while Gebruah tears down (catabolism) reflecting the dynamism of Chokmah. The Tree works in cross-patterns. Chesed is Mercy. Geburah is Strength. They are the two arms of the man, one which gives, and the other which takes away. Chesed, related to Jupiter, is a Mighty King. He is the kindly and benevolent ruler. Geburah, related to Mars, is also a King, but he sits in a chariot, armed for battle. The text of the Thirty-Two Paths of Wisdom describes Chesed as containing all the Holy Powers meaning, again, that it is the first of a new sequence and is related to Kether by its primacy in another order. The image of a mighty and loving ruler conveys the idea that it is a potency which guides and controls the course of manifestation. It establishes the underlying framework on which matter is built. It is the realm of the archetypes described by Plato in the ninth book of his Republic, and the various symbols of Chesed make suggestions about the function and purpose of these archetypes. The first is the Pyramid, a tetrahedron used as a building form by the society which gave us the first monumental stone architecture. It brings together four sides, each of which point upwards. Energy flows down from above, and is spread equally through each of the sides. Thus does Chesed contain all the Holy Powers. 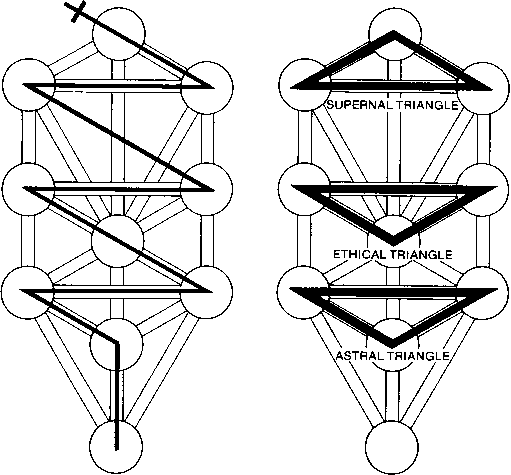 It is renewed manifestation of the Four, encountered first in the Primordial Elements of Kether, and establishes the archetypal pattern for matter fully expressed in the subdivided elements of Malkuth. Moreover, we recall the Pentagram as the symbol of perfected mankind, having four lower Elemental points and the upper point of Spirit which is a directing force, once the Elements are in balance. The principle of the Pyramid is the same, and amplifies the text which describes Chesed as "measuring and cohesive," as well as "receptacular," meaning that it is a receptacle for the Higher Powers. In line with the aspects of rulership, to Chesed are also assigned the Sceptre an the Orb. 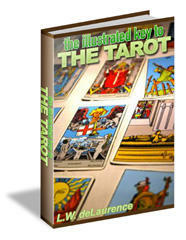 Both are found in various cards of the Tarot deck. The sceptre is phallic and relates to Chokmah, while the Orb represents aspects of Binah. It also suggests the rulership of the Four Kerubim, first found in Kether, over the manifest kingdom of Microprosopus, formed by Chesed and the next five Sephiroth. The final symbol of Chesed is less obvious than the others. This is the Crook of a Shepherd, or a Bishop in his role as the Pastoral Shepherd. Another title for Chesed is Love, which in this case means the love of the ruler for his subjects, or the shepherd for his flock. The Crook is also found in THE HIEROPHANT, the card of organized religion, which should be carefully studied in terms of this Chesed symbolism. Who is the angel of the sephira chesed?